Virtual reality is making a comeback, said Mandy Rose, Senior Research Fellow at the Bristol Digital Cultures Research Centre, introducing New Media artist Oscar Raby to a packed audience on 24 October at the Pervasive Media Studio. Heralded in the 1980s by Timothy Leary and others as a new form of experiential connectivity, VR’s early manifestations failed to meet expectations and it was sidelined by the rapid development of the World Wide Web. However, technical developments and the enthusiasm of a new generation of media artists have made for a resurgence of immersion in a technologically mediated reality. 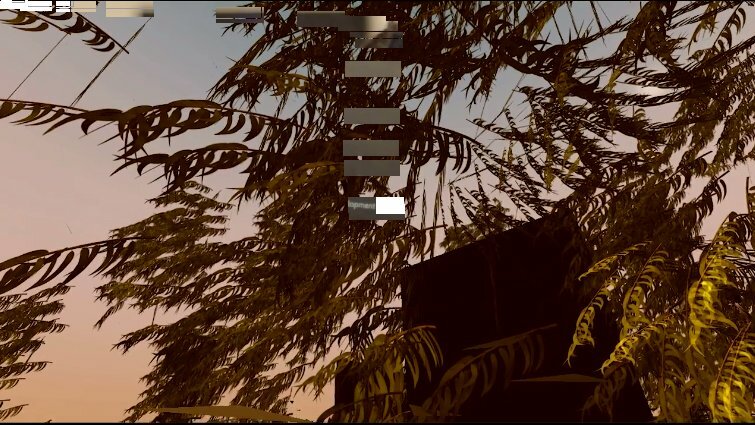 Oscar Raby’s Assent is (in the words of Rose) “one of only a handful of projects that currently sits at the intersection of documentary, interactivity and virtual reality”. After the military took control of Chile in the coup of September 1973, a “Caravan of Death” travelled the country by helicopter, conducting executions of military detainees. According to Oscar Raby, this was a mechanism to instil terror into the community. It was also a way of demonstrating the force of the central authorities to military staff outside the capital, and, by making them complicit in the actions of the junta, to ensure their loyalty. Oscar explains that his autobiographical immersive documentary “puts the user in the footsteps of my father, who in 1973 was a 22-year-old army officer stationed in the north of Chile, on the day when the Caravan of Death came to his regiment. By putting the audience on the scene alongside my father using virtual reality technology, Assent provides the audience an opportunity to engage personally with the events and emotions of that day, through his eyes, and mine”. After attending an introductory talk by Oscar, I had the opportunity to experience Assent. 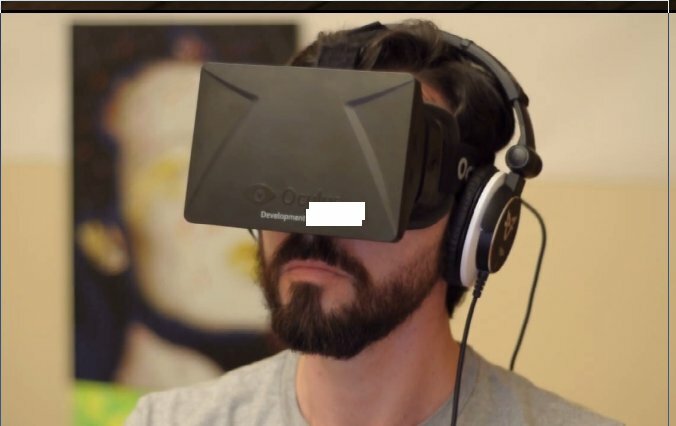 The Oculus Rift viewing equipment was a black box resembling a pair of covered, chunky binoculars that covered my eyes and was held to my head by an elastic strap, augmented by a pair of stereo headphones. It was not very large but was initially slightly uncomfortable. Throughout, I retained my sense of being grounded, sitting in a chair in the Pervasive Media Studio; if I moved my eyes downwards, I could see a chink of daylight. Nonetheless, the virtual reality experience was unique and extraordinary. After a brief introductory warning text about the experience to come, I found myself in Oscar’s studio. I could look all around, at the walls, floor and ceiling, and everything was there. There appeared to be an overhead projector on the floor; several paintings displayed on the walls; chairs and tables; and lights hanging from the ceiling. As my friend Terryl Bacon, who also viewed the presentation, pointed out, this immersion experience was very unlike participation in a computer game: it was contemplative. Suddenly, Oscar appeared, standing in the room. He was flat and immobile, like a cardboard cut-out; this was the appearance of all the characters that appeared in the presentation. He spoke to me as his father: he said that he thought I might have found the equipment hard to manage, and was glad I was there. You can hear this part of the presentation in the first part of the trailer. Speaking as to his father, the virtual Oscar told me that he was going to take me back to that day in 1973 when I witnessed the execution of a group of prisoners captured by the military regime in Chile. The scene changed to a well-realised three-dimensional representation of a field with low hills in the background. Oscar’s recorded voice told me to look intently at two figures in the distance. This action took me rapidly towards the figures, one of whom was Oscar. He continued the story suggesting that this time I could take more time than I was able to do on that fateful day in 1973. I wanted to take time, and enjoyed looking carefully at the features of trees that moved three-dimensionally through space as I turned towards them. But I was disturbed by the fact that I couldn’t see my feet. I looked down. I felt as if I was in the scene but I wasn’t there. But there was little time to reflect on this, as soon we were carried forward through the leaves and branches of three-dimensional woodland to the scene of execution, represented by a number of figures, two of whom resembled Oscar and his father. A rifle cracked intermittently and the figures became grossly distorted. I am not sure whether the presentation suffered a glitch at this point or whether I failed to pause the programme by looking intently at the figures; Terryl tells me that she was able to look at them for a while and to see sky through their mouths and eye-sockets. The presentation finished and the real-life Oscar removed my headphones and viewing equipment. I sat, moved by the horror of the execution and by the extraordinary three-dimensional experience in which I had been immersed. I didn’t know what to say, and there were people waiting to engage with the experience; so I told Oscar that I would write to him. This blog is my response. A disturbing and provocative aspect of this virtual reality experience was the conflict between participation and passivity. At the beginning, when I appeared to be inside Oscar’s studio and could look wherever I wanted, I felt master of the situation. But, as the story unfolded, I became aware that the scope of my participation was extremely limited. As Oscar said in his introductory presentation, the viewer is on a track. Indeed, I could not change the events at all, beyond spending a longer time looking at the landscape than Oscar’s father would have done on that traumatic day. As I say, I may have failed to manage the last part effectively, but I did not see the death squad; I saw only the distorted bodies of a few soldiers and civilians. The last part of the presentation resembled the shocking climax of a movie that I could only watch. The effect was similar to the last part of the trailer. On reflection, I think that reasons for the experience of the last part of the programme may have to do with the artist’s difficulty in rendering the execution, even though he has been in conversation with his father about it for over twenty years. Although the viewer is put in the position of Oscar’s father, the actual moment of execution is elided from this immersive virtual reality. The artist’s agony over his father’s participation may be suggested by the presentation’s title, Assent. The question that arises for me is: can a VR presentation do more than add a further dimension of immersion to the viewing experience? Can the viewer’s contemplation change the experience, or bring a new perception to it? Or is even the experience of immersive reality inevitably confined by the artist’s conceptualisation? I’ve recently had discussions of Brian Cox’s The Human Universe with various friends including Guy Saunders (https://drguysaunders.wordpress.com/). They influenced but are not responsible for the opinions expressed below! 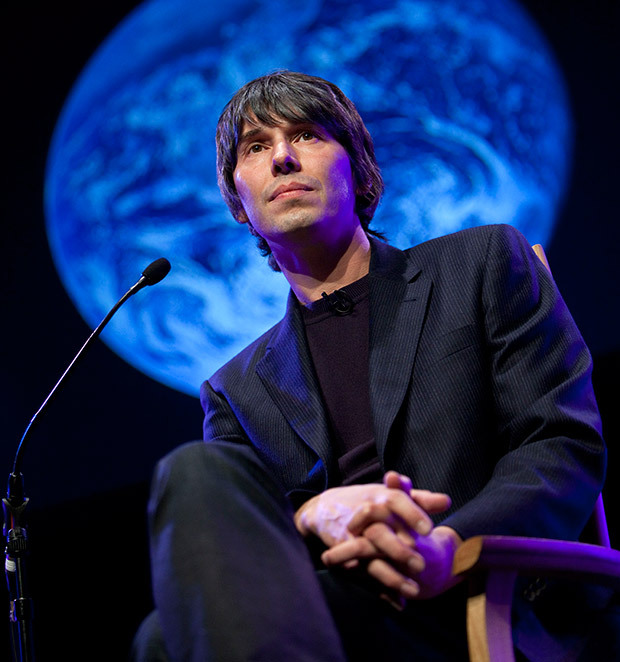 Brian Cox’s new science series on BBC 2, The Human Universe, focuses literally on the human brain. The first programme attempts to answer the question: who are we? As the camera closes on a model of the brain, Cox offers one possible answer: that we are “something that arises from electrical activity inside this impossibly complex blob of matter”. The Human Universe, like Cox’s previous science programmes for television, induces the viewer to share the professor’s sense of wonder. In this case, we wonder at the capacity of the human brain, which, we are told, contains perhaps as many neurons as there are galaxies in the universe. 200,000 years ago the brain had reached much the size it is today, and a child transported from that early human world to be educated in school today would be able to learn alongside contemporary children. Cox uses the ancient Jordanian city of Petra to illustrate an ill-defined moment in human evolution when man decided to build a civilisation. He emphasises the importance of language and writing for the transmission and storage of accumulated knowledge. But our first glimpse of the rock cut buildings of Petra highlights what is missing in this paean to neuroscience. We are looking at evidence of a culture. Super-capacious human brains working together produce a culture, but they are then produced by it. Without comment, Cox gives an account of the difference between the high road in Petra used by men of power and the hidden tracks used by common people. Looking in wonder at a skull that formerly contained 80 billion neurons tells us nothing of interest about the way in which civilisation has developed specific cultural forms. The development of culture is more than the accumulation of knowledge and technology. The technological advances that have brought us from ape-man to spaceman have been produced not only by big brains but also by social and cultural life. Such life certainly develops as a result of communal brain activity, but its genesis and power cannot be explained by however many billion neurons. The human universe is the universe of culture.